So the Red Dragon / Reddragon / Redragon, however they prefer to be called, gaming keyboard and mouse combo package is a pretty good deal for a decent price. I’m not going to wow you on the stats of a keyboard, as I think they’re pretty standard, but I’ll point out what I like about it. The keyboard itself has no real “panache” to it aside from two accent lights on the lower palm rest (which is really more of an aesthetic palm rest and not a functional one, it’s much too short) and then some smaller accent lights at the top center of the keyboard. One centralized dragon logo is illuminated as well. The W A S D keys and Up Down Left Right Arrows are all bright red, which for a gaming laptop is a nice feature to specifically highlight the keys that’ll probably be used the most. They’re interchangeable, but I’m not sure why. 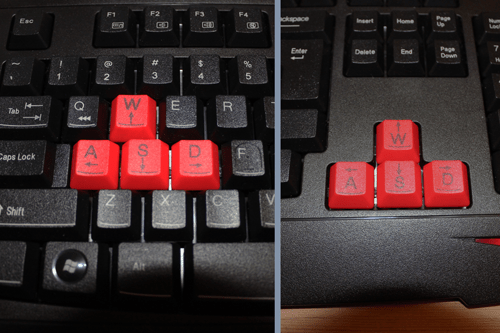 Whether or not it’s to extend the life of the keys, or because the positions of the arrows and letters are flipped on the two sets. The keys have a good de-press function and the spring back is good. The only frustrating thing is you can hear the spring mechanism on the key release on some keys and it’s kind of squeaky and not springy and I’m hoping over time that goes away as I “wear” them in. You really only notice it when you’re typing things like reviews for keyboards and games, or long winded skype chats. As far as gaming goes, the keyboard has two resting forms. Either flat on a table, or there are extendable legs which will elevate the keyboard about a half an inch. I prefer the keyboard angled, and it’s just about the right height that doesn’t make my hand uncomfortable after a long winded Counter Strike or Insurgency session. That said it’s not the worst thing ever if you had to use the keyboard flat on your lap either. The white letters on black keys (aside from grey on the red keys) gives ample contrast to make using the keyboard in low light settings good, though depending on your gaming setup the accent lights might give enough ambient light to still provide some extra visibility. But the most frustrating thing about this keyboard is the enter key. Instead of your usual rectangular enter/return key, they decided to change the forward slash key and make the enter key like a big square. WHY!? I haven’t seen a return key like this since the Apple Performa series and you go and do this Red Dragon? Ugh. It’s frustrating to get used to, but you’ll soon get used to overextending your pinky to be SURE you don’t hit “\” instead of the enter key. It works well on my Mac as well as my PC (I used it on my personal laptop and work PC for a few days each) and it seems pretty sturdy and reliable for most everyday use as well as gaming. The mouse is much of the same. It’s rated at 2000 dpi and has a center switch that rotates between 3 dpi modes so you can adjust for gaming without having to change sensitivity in menus, which is a nice touch. The big drawback on the mouse for me is the symmetry of the design. Our hands aren’t symmetrical, and while I appreciate the elegance of the design itself, the form needs to suit the function. The contours on the sides of the mouse are great for your thumb to rest if you’re a righty or lefty, but the ring and pinky finger just don’t seem to sit comfortably given the small area for your palm to rest on the mouse itself. So if you’re got bit mitts, you might want to look into a slightly larger mouse. The buttons on the mouse feel good, and the texture of them is also kind of gritty which I like since your fingers won’t slip off in the heat of the moment. The scroll wheel is grooved rubber which is a bit weird but I’ve gotten used to it. There are also two programmable buttons on the side (for PC users) that are in near perfect placement for where your thumb naturally wants to rest on the mouse. 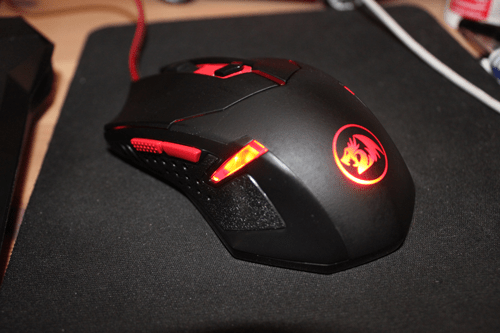 The red lighting on the mouse is also pretty cool, and matches the keyboard as well. Both the KB and Mouse have that “braided” style USB cable that’s red and black, which keeps the aesthetics of them both inline. I wish the USB ends of them were a little smaller and more compact, as they’re basically rubbing against each other in my macbook. I also wish the keyboard had a USB port built in for the keyboard so I didn’t have to eat both my USBs on my laptop when I’m gaming. So overall? I got this set on Amazon for $28 and that’s a pretty good value considering I haven’t broken them yet. I do think they’re well constructed though I found the packaging to be a little on the cheap side (amazon thankfully packs okay enough to get it here intact), but for what you get I think the value is there. I originally was going to test it alongside a Cooler Master KB&M set, but the KB didn’t work with my Macbook so I simply returned it. Compared to my Mac brand external USB keyboard, I’d much rather the Red Dragon for gaming since the keys have more feel to them when you’re using the WASD keys to move around. It just feels better. So if you don’t mind not having a backlight and can get used to the weird return/enter key, it’s a worthwhile investment. Or if you’re looking for a comparable set, the Cooler Master set I was going to check out was around the same price-point, but it is PC only. Wanna see more reviews like this? Follow us on Twitter, or Leave a comment below! If you’re a tech company, get in touch with us if you want us to check out your products! Ep 16 – Main Characters With Voices…Yay or nay?